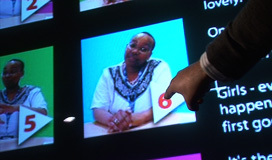 The Narrative Centre within The UCH Education Centre is the first interactive display of its kind in the NHS. The first of its kind in the NHS: our interactive Narrative Centre illuminates the big impact of the small things in healthcare provision. "We can issue as many strategies and policies as we want nationally or within a hospital, but people will respond more to actions, behaviours and values - they remember stories more easily than statistics, and stories are the currency of culture." For more information visit Booking & Room Hire. The Narrative Centre exists as an open zone, an area of exploration in The Learning Hospital at The UCH Education Centre. Its purpose is to reflect personal experiential stories of the hospital from the perspectives of patients, relatives, carers and staff. "Every training activity undertaken here is focused on the same issue: how will this benefit patient experience? We have developed an integrated programme of education at the Learning Hospital that will inform the attitudes, expectations and behaviours of staff such that they can do that." It is also a forum to illuminate how the small things make a big impact – dignity, respect and trust. It offers insights to motivate. It can serve to deliver information, share experiences and offer challenges. New touch-screen technology and large interactive displays also make The Narrative Centre ideal for project briefings, presentations or reviews.